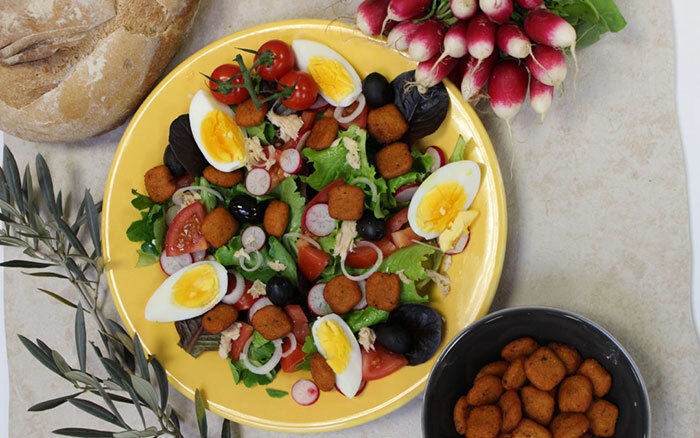 There’s so many debates about the niçoise salad : while Auguste Escoffier, famous French chef persists in adding rubber green and potatoes into it, the real nissart are not joking on this point. There are unanimous : there aren’t any cooked foodstuff in the genuine Nice salad (except tuna and hard-boiled eggs). 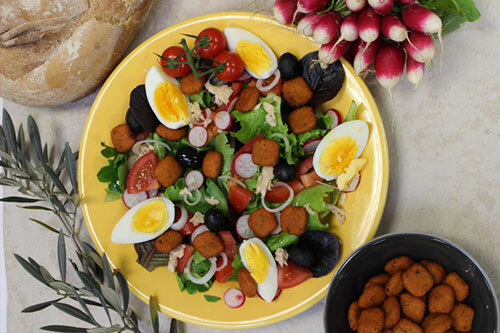 Originally, the niçoise salad is made up with local food and intended for poor people. Later, it get some colours and is on the rise. Polenta… Finding its roots in Italy, what could be better that this generous corn meal to go with the niçoise salad ? Natural source of minerals and vitamins, it will be able to complement any salad as such as crouton. Varachaux is playing with shapes : among fingers, sticks, usual meatballs, we can offer you polenta stamps. In a Provencal style, unflavoured, with spinach, Varachaux can adapt the recipe to your plans !